When first seen close to the limb (and in poor conditions) it was only a vaguely dark spot, I [thought] likely to be just a normal dark polar storm. However as it rotated further into view, and the conditions improved I suddenly realised that it wasn't just dark, it was black in all channels, meaning it was truly a black spot. Wesley sent an e-mail to others including the NASA Jet Propulsion Laboratory in Pasadena, California reporting his observations. Paul Kalas and collaborators confirmed the sighting. They had time on the Keck II telescope in Hawaii, and had been planning to observe Fomalhaut b, but they spent some of their time looking at the Jupiter impact. Infrared observation by Keck and the NASA Infrared Telescope Facility (IRTF) at Mauna Kea showed a bright spot where the impact took place, indicating the impact warmed a 190 million square km area of the lower atmosphere at 305° west, 57° south near Jupiter's south pole. The spot's prominence indicated that it was composed of high-altitude aerosols similar to those seen during the SL9 impact. Using near-infrared wavelengths and the IRTF, Glenn Orton and his team detected bright upwelling particles in the planet's upper atmosphere and using mid-infrared wavelengths, found possible extra emission of ammonia gas. The object that hit Jupiter was not identified before Wesley discovered the impact. A 2003 paper estimated comets with a diameter larger than 1.5 kilometers impact Jupiter about every 90 to 500 years, while a 1997 survey suggested that the astronomer Cassini may have recorded an impact in 1690. Given the size of the SL9 impactors, it is likely that this object was less than one kilometer in diameter. Finding water at the site would indicate that the impactor was a comet, as opposed to an asteroid or a very small, icy moon. At first it was believed that the object was more likely to be a comet since comets generally have more planet crossing orbits. At the distance of Jupiter (5.2 AU) most small comets are not close enough to the Sun to be very active, and so would be hard to detect. Small kilometer-sized asteroids would also be hard to detect, however, and recent work by Orton et al. and Hammel et al. has strongly suggested the impactor was an asteroid, as it left only one impact site, did not reduce Jovian decametric radiation emission by contributing significant dust to the Jovian magnetosphere, and produced high altitude dusty debris full of silica, very different than what was produced by SL9. As of 2012, the impactor is believed to have been an asteroid with a diameter of about 200 to 500 meters. Assuming it was an inactive comet (or asteroid) about 1 km in diameter, this object would have been no brighter than about apparent magnitude 25. (Jupiter shines about 130 billion times brighter than a 25th magnitude object.) Most asteroid surveys which use a wide field of view do not see fainter than about magnitude 22 (which is 16x brighter than magnitude 25). Even detecting satellites less than 10 km in diameter orbiting Jupiter is difficult and requires some of the best telescopes in the world. It is only since 1999 with the discovery of Callirrhoe that astronomers have been able to discover many of Jupiter's smallest moons. On June 3, 2010, Anthony Wesley discovered another impact event, smaller than the previous observed impacts. The 2010 impact was then discovered to have also been captured on video by amateur astronomer Christopher Go in the Philippines. ^ Dennis Overbye (2009-07-24). "Hubble Takes Snapshot of Jupiter's 'Black Eye'". The New York Times. Retrieved 2009-07-25. ^ a b c "Hubble Captures Rare Jupiter Collision". Hubblesite (STScI-2009-23). 2009-07-24. Retrieved 2009-07-24. ^ a b c Jupiter pummeled, leaving bruise the size of the Pacific Ocean. University of California, Berkeley press release, July 21, 2009. ^ a b Jia-Rui C. Cook (January 26, 2011). "Asteroids Ahoy! Jupiter Scar Likely from Rocky Body". News and Features @ NASA/JPL. Archived from the original on 27 January 2011. Retrieved 2011-01-26. ^ Mackey, Robert (July 21, 2009). "Amateur Finds New Earth-Sized Blot on Jupiter". The New York Times. Retrieved 2009-07-21. ^ Wesley, Anthony. "Impact mark on Jupiter, 19th July 2009". (jupiter.samba.org). Archived from the original on 2009-07-23. Retrieved 2009-07-21. ^ O'Loughlin, Toni and agencies (2009-07-21). "Amateur astronomer spots Earth-size scar on Jupiter". London: The Guardian. Archived from the original on 29 July 2009. Retrieved 2009-07-21. ^ Martinez, Carolina (July 20, 2009). "New NASA Images Indicate Object Hits Jupiter". Jet Propulsion Laboratory. Archived from the original on 27 July 2009. Retrieved 2009-07-21. ^ Longo, Giuseppe (2007). "18: The Tunguska event" (PDF). In Bobrowsky, Peter T.; Rickman, Hans (eds.). Comet/Asteroid Impacts and Human Society, An Interdisciplinary Approach. Berlin Heidelberg New York: Springer-Verlag. pp. 303–330. ISBN 978-3-540-32709-7. . Accessed 2009-07-27. Archived 2009-07-29. ^ D. A. Crawford. "Comet Shoemaker-Levy 9 Fragment Size" (PDF). Lunar and Planetary Institute. Retrieved 2009-07-22. ^ "Surprise Collision on Jupiter Captured by Gemini Telescope". Gemini Observatory. Retrieved 2009-07-24. ^ Perlman, David. "Glowing scar is revealing Jupiter's secrets" San Francisco Chronicle, 23 July 2009. ^ Grossman, Lisa (2009-07-21). "Jupiter sports new 'bruise' from impact". New Scientist. Archived from the original on 3 August 2009. Retrieved 2009-07-22. ^ a b c d Carl Hergenrother (2009-07-21). "More on the Jupiter Impact". Retrieved 2009-07-24. ^ Scott S. Sheppard. "New Satellites of Jupiter Discovered in 2003". Carnegie Institution (Department of Terrestrial Magnetism). Archived from the original on 8 June 2009. Retrieved 2009-07-23. ^ "New moon of Jupiter found". SpaceFlight Now (University of Arizona News Release). Retrieved 2009-07-23. ^ a b Bakich, Michael (2010-06-04). "Another impact on Jupiter". Astronomy Magazine online. Retrieved 2010-06-04. Hammel, H. B.; Wong, M. H.; Clarke, J. T.; De Pater, I.; Fletcher, L. N.; Hueso, R.; Noll, K.; Orton, G. S.; Pérez-Hoyos, S.; Sánchez-Lavega, A.; Simon-Miller, A. A.; Yanamandra-Fisher, P. A. (2010). "Jupiter After the 2009 Impact:hubble Space Telescopeimaging of the Impact-Generated Debris and Its Temporal Evolution". The Astrophysical Journal. 715 (2): L150. Bibcode:2010ApJ...715L.150H. doi:10.1088/2041-8205/715/2/L150. .
Sánchez-Lavega, A.; Wesley, A.; Orton, G.; Hueso, R.; Perez-Hoyos, S.; Fletcher, L. N.; Yanamandra-Fisher, P.; Legarreta, J.; De Pater, I.; Hammel, H.; Simon-Miller, A.; Gomez-Forrellad, J. M.; Ortiz, J. L.; García-Melendo, E.; Puetter, R. C.; Chodas, P. (2010). "The Impact of a Large Object on Jupiter in 2009 July". The Astrophysical Journal. 715 (2): L155. arXiv:1005.2312. Bibcode:2010ApJ...715L.155S. doi:10.1088/2041-8205/715/2/L155. .
Wikimedia Commons has media related to Jupiter 2009 impact event. 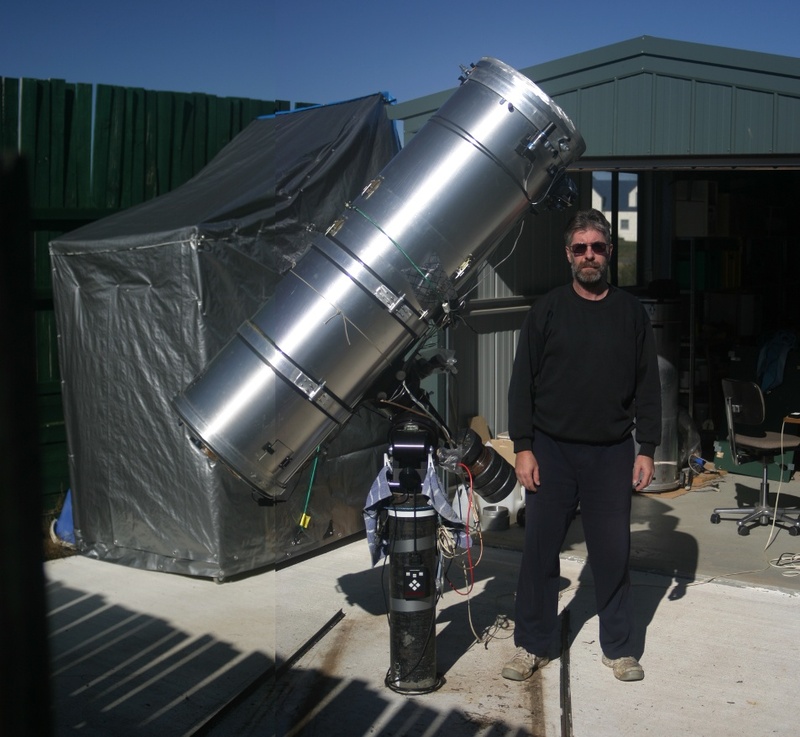 "Photo of Anthony Wesley and his telescope". (jupiter.samba.org). Archived from the original on 26 July 2009. Retrieved 2009-07-21. This page was last edited on 2 April 2019, at 08:11 (UTC).